"This is an excellent recipe for an often overlooked and unpopular root vegetable. 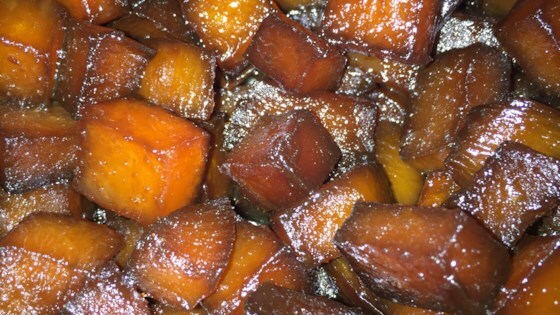 Even folks who dislike Rutabagas love this delicious dish. Added bonus is this is a great way to introduce this vegetable to kids. A Southern staple with a sweet Asian twist!" Melt butter in a large skillet over low heat; add brown sugar and cook and stir until brown sugar has dissolved. Stir water and soy sauce into butter mixture, increase heat to medium-high, and bring mixture to a boil. Stir in chopped rutabaga and return to boil. Reduce heat to low and simmer, uncovered, stirring frequently, until liquid is absorbed, about 45 minutes. Not sure what went wrong. Quickly scorched in spite of burner on medium. Maybe my electric stove is in the hotter side. Disappointed. Great recipe! I did use less brown sugar, the recipe says "or to taste." My husband really loved it, I did too. This was absolutely delicious. I followed the recipe exactly and it was perfect. I will definitely make it again and our friends requested the recipe. A definite keeper!